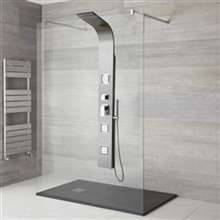 The Ermanno Rainfall Massage Shower Panel System has a square rainfall showerhead, six body massage jets and a brass handheld shower for added coverage. Easy installation and comes with all standard installation accessories. Jet nozzles for water massage. 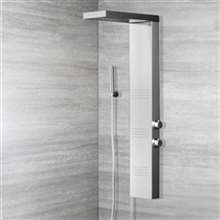 Asides the really great functions and finish of this shower panel, i found it quite easy to install. The instruction manual was quite detailed. Great shower panel so far, i recommend. I don't understand what went wrong with the installation, but I'm just glad that it worked well in the end. They said that the fittings are standard and should have no problem, but I don't know, we had to adjust some of them. Still after all the work everything's alright and the shower panel works darn well now. The massage is the best part about this shower panel, I simply love it, and the nozzles are placed in the perfect spots for me. It was very easy to install and no extra parts were needed, so even if it was a little pricey at least I had no more spending with it. I was really happy when I saw this shower panel on sale. It was just what I wanted. Well, there was another shower panel I was eyeing but that was really expensive so I got this one. There's nothing wrong with this shower panel though. It's great. I've been using it for a while now and I'm happy with it. It's the delivery though that was a bit frustrating. It took about three weeks for this to get delivered to my doorstep. If you're looking for a shower panel, then I would highly recommend this one. I've only had this shower panel for about 3 weeks or so, but I can say that this is one excellent product. The features were amazing and every component worked very, very well. I was quite hesitant to make the purchase at first because of the price, but now I can say that every dollar spent on this thing is well worth it.